Should your baby’s nursery be neutral? I am seeing a new trend: baby nurseries which are not only gender-neutral, but neutral in coloration as well. b) color is a wonderful intellectual stimulant for babies (just like it can be for adults). 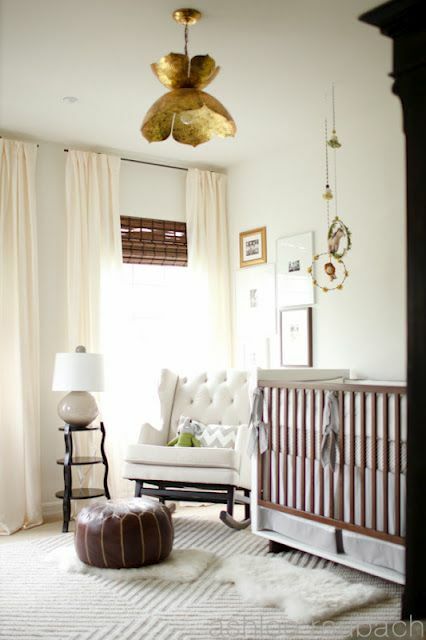 I have seen some very neutral-in-color nurseries, like the one above, that are gorgeous. in color theory, neutral coloration promotes contemplation more than stimulation. Bring some upbeat color into the space if you decide to decorate with pale neutrals. Use bright colorful accessories, crib mobiles, and toys to attract and hold your baby’s interest. This entry was posted on October 9, 2012 by Ellen at Color Calling. It was filed under Residential styling .